This still image and set of animations show NASA's Voyager 1 spacecraft exploring a new region in our solar system called the "magnetic highway." In this region, the sun's magnetic field lines are connected to interstellar magnetic field lines, allowing particles from inside the heliosphere to zip away and particles from interstellar space to zoom in. Image released Nov. 29, 2012. 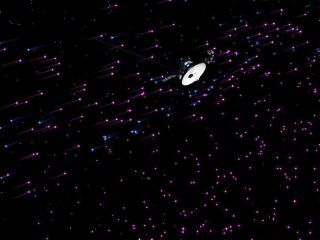 NASA's Voyager 1 spacecraft has discovered a new layer of the solar system that scientists hadn't known was there, researchers announced today (Dec. 3). Scientists haven't been sure exactly when that exit would occur, and now say the spacecraft are likely in the outermost region of the solar system, which is defined by the extent of the heliosphere, the large bubble of charged particles the sun puffs out around itself. Voyager 1, in particular, has entered a new region of the heliosphere that scientists are calling a "magnetic highway," which allows charged particles from inside the heliosphere to flow outward, and particles from the galaxy outside to come in. "We do believe this may be the very last layer between us and interstellar space," Edward Stone, Voyager project scientist based at the California Institute of Technology, in Pasadena, Calif., said during a teleconference with reporters. "This region was not anticipated, was not predicted." This artist's concept shows how NASA's Voyager 1 spacecraft is bathed in solar wind from the southern hemisphere flowing northward. This phenomenon creates a layer just inside the outer boundary of the heliosphere, the giant bubble of solar ions surrounding the sun. Image released Nov. 29, 2012. "We don’t know exactly how long it will take," Stone said. "It may take two months, it may take two years." This artist's concept shows plasma flows around NASA's Voyager 1 spacecraft as it gets close to entering interstellar space. Image released Dec. 3, 2012. The scientists don't think the Voyagers have left the solar system yet because of the orientation of the magnetic field they detect. So far, this field still runs east-west, in agreement with the field created by the sun and twisted by its rotation. Outside the solar system, models predict the magnetic field to be orientated more north-south. As Voyager 1, the outermost of the two spacecraft, gets farther and farther away, it measures more and more of the higher-energy charged particles thought to originate beyond the solar system, compared to the lower-energy particles thought to come from the sun. "Things have actually changed dramatically," said Stamatios Krimigis, principal investigator of the low-energy charged particle instrument, based at the Johns Hopkins Applied Physics Laboratory in Laurel, Md. "The particles from outside have increased a lot and those on the inside … have dropped quite a bit." The Voyagers are NASA's longest-running spacecraft, and will keep traveling outward even after they've left the sun's neighborhood. However, it will be at least 40,000 years before they ever come close to another star, Stone said. Long before that the probes will run out of power to operate their scientific instruments and beam their findings back home. "We will have enough power for all the instruments until 2020; at that point we will have to turn off our first instrument," Stone said. By 2025 the last instrument will have to be turned off. "We're very lucky that there seems to be a compatibility between our mission and the extent of the heliosphere," Stone said.